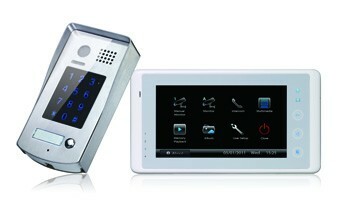 Aesthetically appealing high resolution Video Intercom that is expandable up to 4 door stations and 16 rooms stations. Ideal for both domestic and commercial applications, the units wire using cat5 cable for easy installation into new or retrofit projects. This Challenger Pro series intercom features a large 7-inch touchscreen monitor for clear visitor identification and a vandal resistant easy operation control you cant go past the Provision Security PRO16W. The 2 wire video intercom kit features a super slim 7" high resolution display monitor and vandal resistant stainless steel door station with keypad access and adjustable camera.